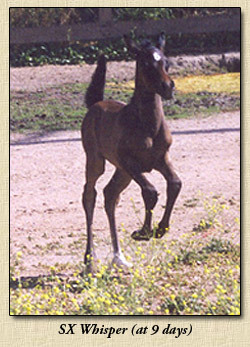 OB Blitzkrieg Bey (Blitzen of Pico x Mariah Bey by Huckleberry Bey) is proud to announce the arrival of his daughter, Berry Haat Salza, foaled on May 25, 2005. Proud dam is Haat Shat Ripstar (Jesta Banddettobey x Pico Stardust by Pico Haat Shaat) owned by Dian Woodward. Isn't this filly just gorgeous? She's so friendly it is hard to get good pictures of her, but at least with this photo you can see she's body beautiful with the tippiest ears ever! 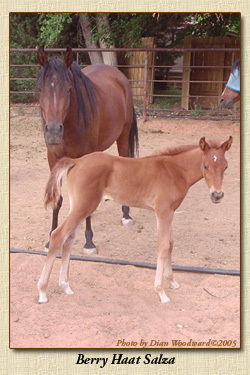 SX Whisper (Serazim x SX Alaura by SX Staleys Gemini) was born May 14, 2005 dysmature and had a tough time at first. Tiny "Whisper" did not have much of a sucking reflex and needed lots of fluids, antibioticis, anti-diarrheal meds and more, on an every 4 hour schedule. She also needed to be kept warm since her circulation was poor. Foal blankets were huge, but we found that our Whippet dog blankets fit just fine. She slept at night with several blankets on top of her and me lying with "Whisper" cuddled up to me. She never moved and mom let us do everything, never complaining. She seemed to know that we were trying to help her tiny child. By age 9 days, "Whisper" was active and got to go outside for the first time. She has continued to grow and prosper and reached the size of her sibling, "Brighton", all the while acting like a spoiled princess. That's OK! 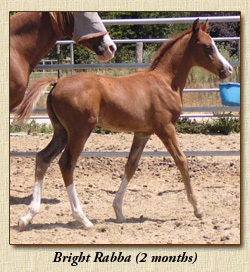 Bright Rabba (FV Sharabba x Galana'Zi by Galan) was foaled May 23, 2005. "Brighton" is a very special colt, and I am very proud of him. David Ward says: "This is the foal I always knew Galana'Zi could have." With his pedigree boasting double Aurab and triple Ga'Zi and his dam being sired by the grand Abu Farwa son, Galan, "Brighton" has the pedigree credentials to be a herd sire. He is very balanced and, all things considered, may well be our replacement for FV Sharabba when he goes up to Fairview Stud to stand in Canada. "Brighton" is 100% CMK and Early American Foundation. Copyright � 2003-2007. Website designed and maintained by Suzi Morris. All rights reserved. This page created for SoCal CMK Heritage News Year 2005 and last reviewed for modifications and updates: April 20, 2007.